So the 2015 Mustang now has an independent rear suspension (IRS) and the driveshaft is a little different than the S197 cars. Although the factory one is still a 2 piece shaft, they are different in configuration. Automatic Ecoboost uses a Guibo. What is a Guibo? Its a rubber doughnut coupler like ones used in most European cars. They're put on to make the drivetrain smoother and more soft. But lets face it, soft in a performance car is well, kinda soft. What we have done is make a billet plate to eliminate the Guibo, then changed that end to a 108mm CV joint. The end is pulse welded to the tube on the aluminum shaft and then a 6-bolt CV to the rear also, just like the factory one. Why does DSS use the CV and not a slider like from a 4x4? The reason is that DSS high-speed balances their driveshafts and found out years ago that the CV is more stable and less likely to have Harmonic issues. Also the CV will have a much higher critical speed then a male/female slider. We here at DSS have become a leading force in using CV's on Driveshafts in the aftermarket and have come a long way with how they are made and used. What's great about this car being IRS is that there are no issues with angles, adjustable arms or ride height issues that can affect the drivetrain. 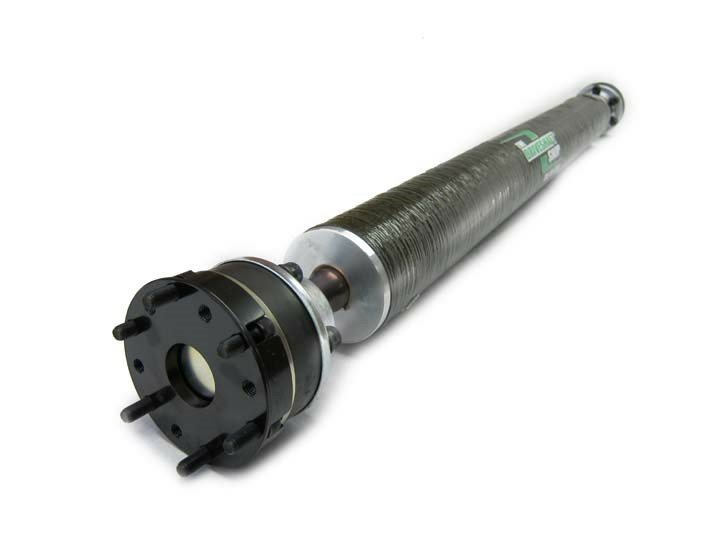 The Carbon fiber driveshaft will give more of a torsional twist but with out the harmful reverse snap given from steel. The aluminum is about half between steel and carbon fiber. This will not only reduce harmonics but also help with 60ft times (aluminum will also be superior over the stock steel 2 piece). And the ends are either Billet or Forged, we never use inexpensive cast parts in our shafts. So there you have it, the new 2015 Mustang shafts from DSS. Installs in 30 minutes or less. 2015 2016 Ford Mustang Ecoboost 2.3 Turbocharged S550 Automatic No one else can stack up to the bold clean styling of our aftermarket Billet dress ups, Street Strip & Racing Suspension & Performance Parts for your late model American Muscle Car!